3 ft. x 7 ft. 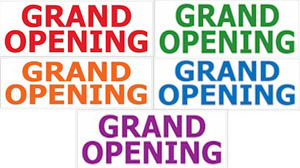 Basic Grand Opening Banner. Yellow banner with Red and Turquoise print on durable outdoor, rip resistant double sewn hems. 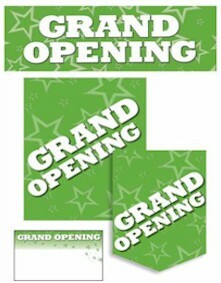 Contemporary 3D Grand Opening Banner Design. Contemporary 3D Patriotic Banner Design. Contemporary 3D Stripes Banner Design. Contemporary 3D Fiesta Banner Design. 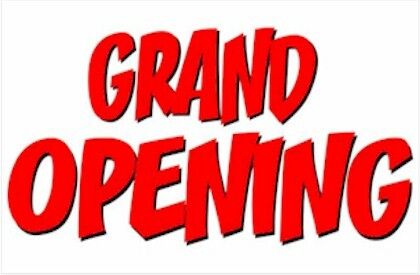 Contemporary 3D Festive Banner Design with Grand Opening in Spanish. Contemporary 3D Metallic Silver and Blue Banner Design with Brown Brick Background. Contemporary 3D Balloons Banner Design on yellow background. Contemporary 3D Balloons Banner Design on purple background. Brilliant yellow polyurethane vinyl banner. Now available in four sizes. Contemporary 3D Banner Design with smiley with a light blue background. 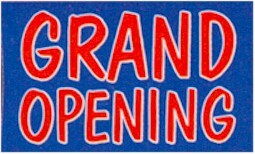 Contemporary 3D Grand Opening dark blue banner with a smiley face to welcome your new customers. Contemporary 3D Banner Design with eye catching salesman. Brilliant white 8mm polyurethane banner. Bright fluorescent red white and blue banner. Contemporary 3D RWB Banner Design with stars background. 3 by 8 Grand Opening Stars Banner, made to go with the Grand Opening Stars Kit. 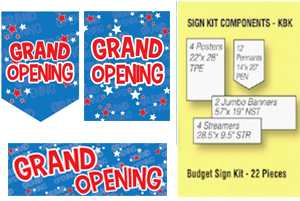 Size is 3 ft. by 8 ft.
Budget Sign Kit - Grand Opening Stars. 22 Signs in 4 popular formats. This is made to match our Stripes Grand Opening Kit. 3 ft high by 8 ft. wide. 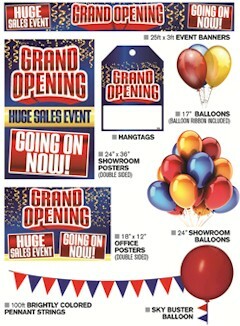 22-piece kit that includes all the signage you will need to advertise your event. Send us your message and artwork and we will create a custom banner. 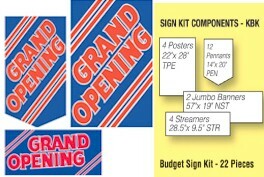 Attract customers to your business with our 61 piece Grand Opening Signage Kit. Large bright fluorescent red white and blue banner. Red, White and Blue 3 ft. x10 ft. nylon banner. 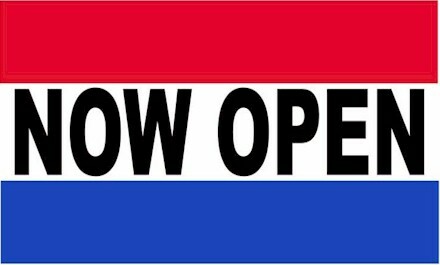 Red, White and Blue Now Open Sign. Available in two sizes. 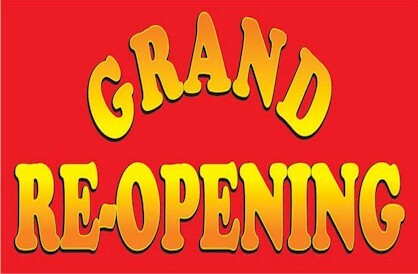 Red banner with yellow grand opening text. Available in two sizes. 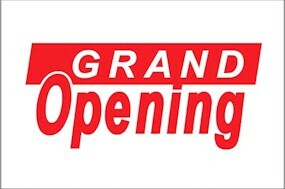 White banner with red shadow grand opening text. Available in two sizes. 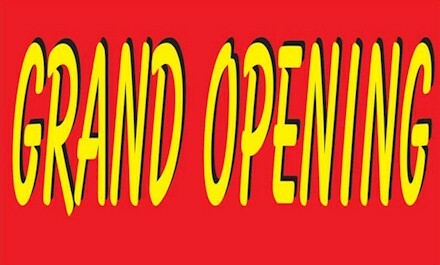 Red and Yellow Fade Grand Re-Opening text. Available in two sizes. 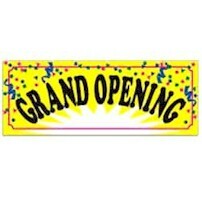 8mm polyurethane banner with artistic Grand Opening design. Bright fluorescent, heavy duty weatherized cloth banner. Contemporary 3D Banner Design on red background. Brilliant yellow confetti polyurethane vinyl banner. Red and White 3 x 5 banner of your choice. 8mm polyurethane banner with Pet Shop Design. 2 ft. by 8 ft. Click on image for details. Brilliant white and blue 8mm polyurethane banner. 8mm polyurethane banner with artistic Yoga design. 8mm polyurethane banner with artistic Tanning Salon design. 8mm polyurethane banner with artistic Floral design. 8mm polyurethane banner with coffee house design. 8mm polyurethane banner with large pair of hair cutting shears!